Jeremy’s dad Brad was an auto-crosser and Vintage racer and got Jeremy interested in racing when he was 16. From the moment he did his first track day he was hooked, and started running a C-Prepared Camaro and a Vintage GT1 1985 Tube Frame Firebird. 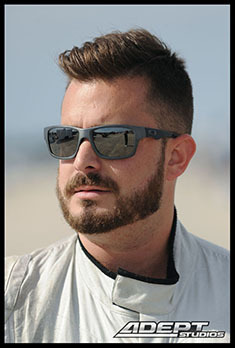 Then in 2002 Brad borrowed a Spec Miata from his friend and business partner, Chris Burson. Brad tried to persuade Jeremy to get into Spec Miata but he had no interest and wanted to run the GT1 Firebird! In April 2012, Jeremy succumbed to pressure and advice from his father and bought a Miata’ the best decision he ever made. 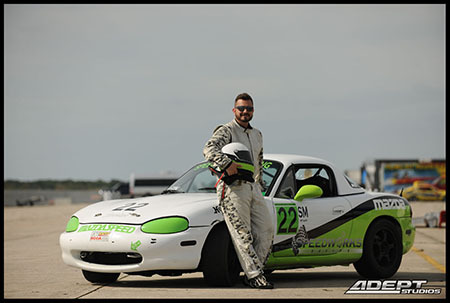 He bought an ex Todd Buras 95 Spec Miata at Daytona and went straight to the SCCA driving school to get his license. Six months later he bought a Rossini powered national event winner built by BSI and driven by Andrew Carbonell. After a wreck at Daytona in August 2013 he decided to open a shop to give his Dad something to do that he loved, while at the same time saving himself a ton of money on track support, repairs, etc. And in September 2013 they opened SpeedWorks Racing, and are looking forward to building their business, continuing our passion, and meeting new people doing what they love! Their first new build should be debuting in the January Majors with another Rossini powered engine!